Hyland Software, established in 1991, is a leading U.S. provider of rapidly deployable enterprise content management software. Hyland develops OnBase, enterprise-class software that combines integrated document management, business process management and records management in a single application. 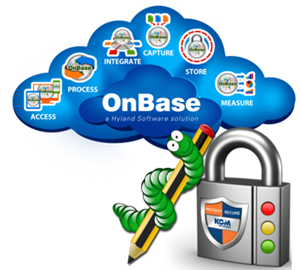 OnBase allows organizations to manage digital content, including scanned paper documents, faxes, print streams, application files, electronic forms, web content, multi-media files, and emails, automate business processes, reduce the time and cost of performing important business functions, improve organizational efficiency and address the need for regulatory compliance through the management, control and sharing of digital content with employees, business partners, customers and other constituencies. Hyland and KOM Software worked together to seamlessly integrate the OnBase ECM software suite with KOMpliance, a secure archive repository. This provides customers with a secure and high-performance archive repository capable of meeting varying compliance regulations and requirements. The tight integration of technologies lets KOMpliance serve as a cost effective, highly efficient and broad data protection and retention solution that is a strong alternative to the more antiquated archive storage infrastructures. The data your organization stores in OnBase is obviously critical. If that data becomes lost, stolen, corrupted or otherwise compromised, there is a range of possible consequences, some of which can be quite severe. The KOMpliance and OnBase integration was implemented specifically to increase data security and meet regulatory compliance requirements by mitigating risks such as data loss, data corruption, accidental deletion, malware and viral infections that can occur outside the context of OnBase Disk Groups. 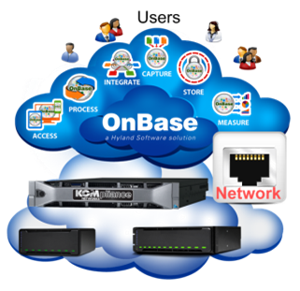 The tight integration of KOMpliance and OnBase means that the security and protection of files and data managed by your OnBase applications is significantly increased both within and outside the context of OnBase Disk Groups. KOMpliance also secures all of the associated files and records (housekeeping, audit logs, etc.) generated by the Retention and Records Management Modules. 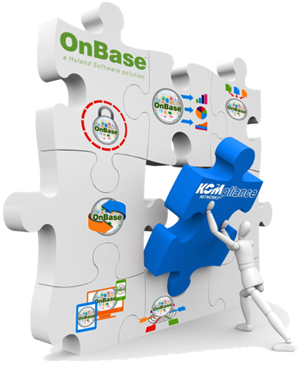 With only three simple steps to deploy KOMpliance in any OnBase environment, the integration of OnBase and KOMpliance sets a new standard that demonstrates the shared commitment between Hyland Software and KOM Software to simplify the customer experience. We work continuously with Hyland to provide customers with the most cost-effective, best-in-class solutions to meet their day-to-day information access, data security and compliance requirements.